Lack of sweating, or anhidrosis, can result from a variety causes, including genetics and certain medical disorders. 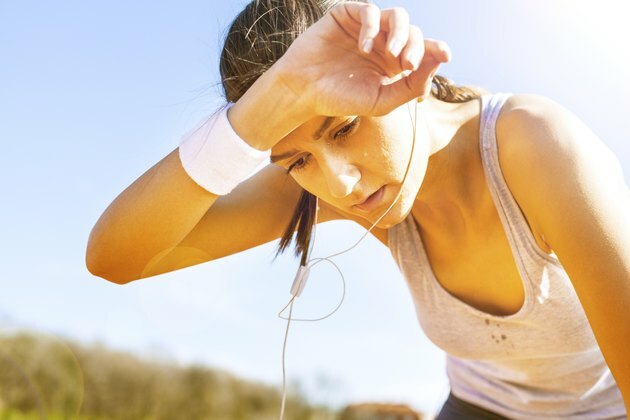 Sweating is your body's way of cooling itself, and if you can't sweat, you can easily overheat. While some people naturally sweat very little or less than others, consult a doctor for a proper diagnosis if you find that you can't sweat when doing heavy exercise or when the temperature is very hot. When the core temperature of your body becomes hot enough, sweat glands release fluids and electrolytes onto the surface of the skin. The sweat evaporates on the skin, cooling the body. The average person is born with 2 million to 4 million sweat glands, which don't become fully active until puberty. Although women have more sweat glands than men, men's glands are more active. A common cause of lack of sweating is not getting enough fluids in your body before, during or after exercise. If you are not drinking enough or are going to the bathroom a lot, you might not have enough fluids to sweat. Another common cause is lack of intensity. If you aren't increasing your core temperature enough, you won't need to sweat. Walking, for example, won't make many people sweat, unless the air temperature is high. If you are sufficiently hydrating before, during and after exercise, and you are exercising vigorously but still not sweating, you may have an underlying medical disorder. Skin diseases that block the sweat glands and neurological disorders, such as Guillain-Barre syndrome, are common causes of the lack of sweating. Nerve problems, congenital disorders, genetic syndromes and trauma to the sweat glands also are possible causes. Some drugs can block the sweat glands and lead to the lack of sweating. Many people who don't sweat find that it runs in the family. While it may just be an oddity of genetics, you are at risk if you can't sweat when it's hot or during vigorous exercise. Consult a doctor for a proper diagnosis. He can run tests to ensure your lack of sweating won't cause a problem. If you find yourself overheating, stop all activity and take a cool shower. If you don't have access to a shower, run cold water over your face or apply a damp towel to your skin. Drink plenty of fluids and find a cool environment in which to to rest until you feel cool.